The sun bear is the smallest bear species. With lengthy tongues of up to 25cm, they are experts at extracting honey from bee nests. They are arboreal, with their small size and long, curved claws helping them move from tree to tree. Sun bears also one of the most vulnerable bear species, under threat from habitat destruction and poaching in their native range. 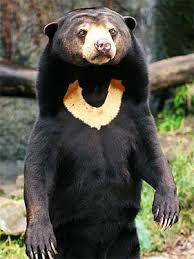 The sun bear can be found in tropical forests of Southeast Asia. It is the smallest species of bear, with a length of up to 5 feet and weighing up to 150 pounds. This small size facilitates their arboreal lifestyle of moving about amongst the trees. Despite their name, sun bears are actually nocturnal, roaming the forests at night. Their fur is mostly black in colour apart from a crescent-like golden patch on their chest. According to legend, this patch resembles the rising sun, hence the name ‘sun bear’. Their coat is well adapted for the tropical rainforest as it is short enough to prevent overheating but is thick and coarse enough to protect against branches and rain. What is the diet of the sun bear? Sun bears are omnivorous, consuming plant material like berries, roots and fruits as well as animals like insects, small birds, rodents and lizards. Honey is also an important component of their diet which they extract from bee nests using their long tongue of up 25 cm in length. Their claws are also quite long and curved which is useful for opening termite nests and climbing trees. They also have a superb sense of smell that they use to locate food. 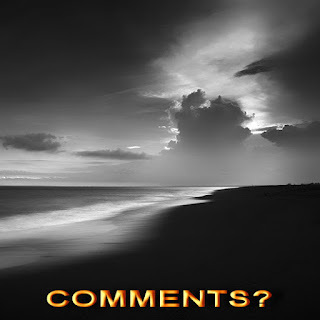 What is the habitat of the sun bear? Sun bears resides in Southeast Asia as far west as eastern India, as far north as southern China and as far south as Indonesia. Their habitat is tropical forest and the type they live in depends on the geographic location. In Borneo, Sumatra and peninsular Malaysia, they occur in tropical evergreen rainforest that consistently receives high rainfall throughout the year. However, on mainland Southeast Asia they can be found in seasonal forests that experience a long dry season. What is the social behaviour of the sun bear? Sun bears can be quite elusive so there is a lack of knowledge about their social behaviour. 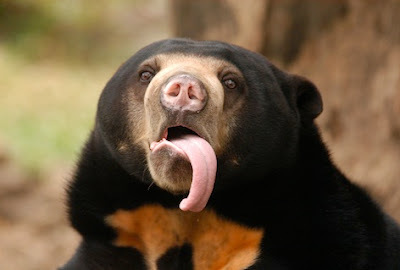 Similar to other bears like grizzlies and polar bears, sun bears are generally solitary. Rarely, they may gather to eat fruit from large trees. Sightings of pairs of sun bears together may suggest that they are monogamous although this is not conclusive. 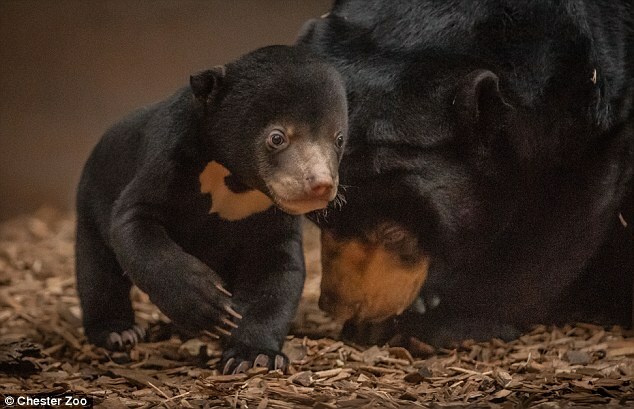 How do sun bears give birth? Sun bears don’t appear to have a defined breeding season and generally give birth to one cub. Cubs are born in dens or in hollow trees and are blind and helpless at first. At around 2 months, they are capable of moving about and weaning takes place at around 4 months. Parental care is important in the early life of cubs and they remain with their mothers for 2 years or more after birth. With estimated population declines of over 30% over the past 30 years, sun bears are classed as Vulnerable on the IUCN Red List of Threatened Species. Sun bears occupy just a fraction of their former range, having been extirpated from many areas it originally occupied. What are the main threats to sun bears? A major reason for the decline of sun bears is destruction of their natural forest habitat, leading to increasingly fragmented populations. Deforestation can occur to make way for plantations of coffee, oil palms and rubber plants. Another threat to sun bears is poaching which is carried out to harvest bear parts. This includes bear gall bladders and bile products which are sold to be used in traditional Chinese medicine. This continues despite the lack of evidence that these have any medicinal benefits. As well as being hunted in the wild, sun bears are also held in captivity for bile extraction. Over 10,000 are kept in cages on bile farms in China and subject to the cruel process of bile extraction, leading to infection and disease. 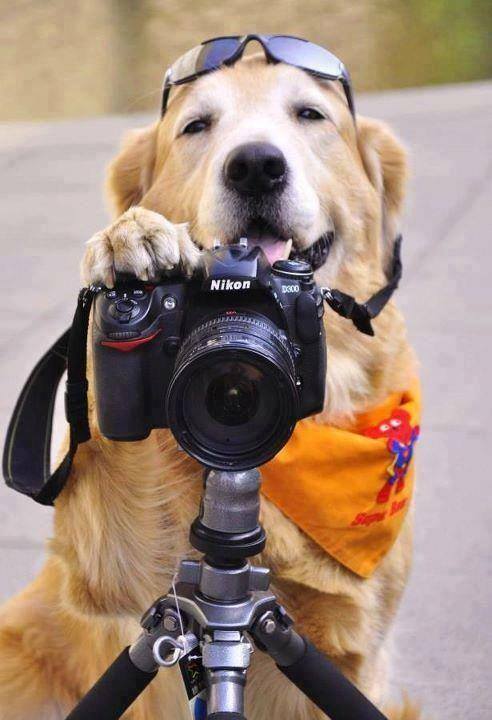 Clancy's comment: Man, that is some tongue, eh?